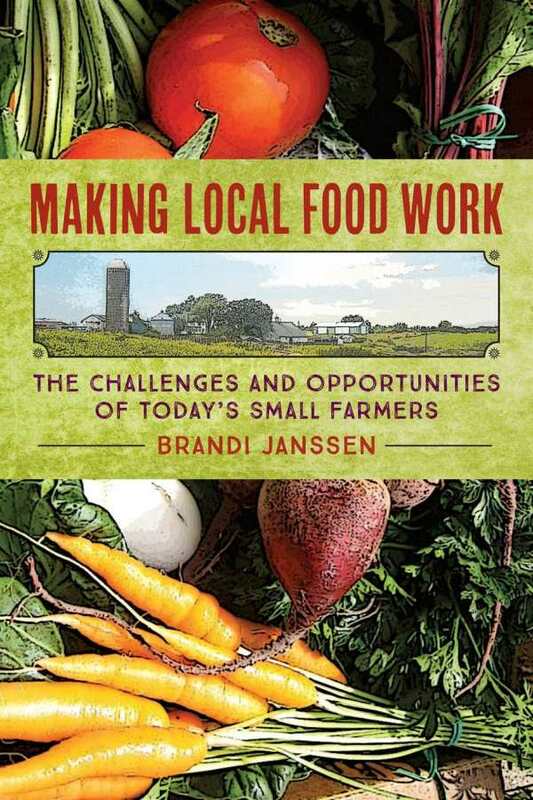 In the age of the locavore, Janssen’s text examines the movement from the perspective of the farmer, combining research with incisive, yet practical, analysis. The book begins with a straightforward explanation of the author’s background and methods. By mentioning that she is an anthropologist, she indicates the tack of the book early: this work does not purport to show how to “make local food work” in a technical or agricultural sense. It does not discuss the details of crop rotation, irrigation, or any of the hundreds of other individual pieces of know-how that go into farming. However, it provides something that may prove more valuable to growers who already know what they’re doing: an overview of the methods that are and are not working for local food growers, from building CSA membership to getting local food into school lunches. Much of the content is based on the author’s direct research with farms and farmers. This includes conversations, many of which appear in the book verbatim, and periods of time that the author spends absorbing the local farm experience. However, this is, in its own right, an academically researched work, relying as much on statistics and facts as on the experiences of the farmers with whom Janssen interacted in the course of its creation. The combination is particularly powerful in conjunction with the author’s highly readable style. Janssen is overtly in favor of local and organic farming, to the extent that she occasionally criticizes current large-scale farming practices. This may generate some controversy, but the research is sound enough, and the book’s tone even enough, that more traditional farmers may also find material for meaningful discussion here rather than fuel for argumentation. No farmer with locavore aspirations can afford to miss this stimulating piece of work.